If you’re in the market for one of the most powerful compact and rechargeable flashlights available, you should look no further than the Stinger DS LED with 120 v AC/DC charger. This small flashlight is nearly indestructible and has an incredibly long lifetime. 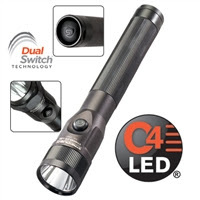 With a 3-cell, 3.6 volt battery with a substantial run time and the ability to recharge up to 1,000 times, this flashlight is perfect for a person or an organization looking for a durable, long-lasting, and powerful flashlight that doesn’t want to replace flashlights too often. One of the most impressive features of this flashlight is the intensity of light it puts out. 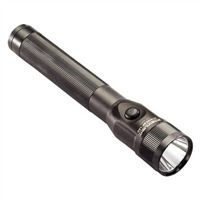 At its highest setting, this flashlight puts out 350 lumens of light. Because of the flashlight’s deep-dish parabolic reflector, you’ll be able to get a concentrated beam of light that goes for 310 meters. This reflector also means you’ll get a wider circle of light, offering you more peripheral vision. In addition to the highest setting, this flashlight comes with three other illumination settings: medium, which produces 175 lumens at a peak beam intensity of 12,000 candelas; low, with an output of 85 lumens and a peak beam intensity of 6,000 candelas; and strobe for use disorienting or signaling your location. The Stinger DS is made with the end user in mind. It includes two power switches to accommodate any way you might hold the flashlight. One is near the head of the flashlight, while the other is at the tail cap. Both are independently controlled, making it much easier to control the flashlight regardless of how you hold it. This LED flashlight has one of the lowest operating costs in its class, too. It costs about 1 cent per hour of usage because of its rechargeable battery and low energy usage. While not indestructible, this flashlight comes pretty close. Click here to view a video of a customer using the Stinger DS as a hammer and see just how well the flashlight holds up. In case it fails on you, though, the DS also comes with Stinger’s limited lifetime warranty. If you have any questions about this flashlight or any of our other LED lighting, don’t hesitate to contact us. We’ve been in the lighting business for years and would love to use our experience to help you choose the best flashlight for your needs.